The North West of Hungary ranges from dense forests on rolling hills to the wetlands and lakes bordering Austria and Slovakia with the Danube acting as a natural border to the North and a myriad of streams, rivers and lakes. 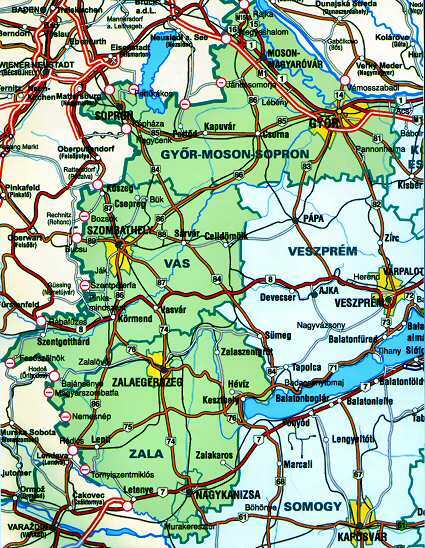 Here can be found the earliest of industrial activity such as the coal and bauxite mines and history of the Hungarian people stretching back over a milennium. Many of the mines have closed, and their locations turned into tourist spots, such as lakes and woodlands. Now in addition to the tourism that the scenic countryside brings, there is a a lot of heavy industry, blended in with 1000 year old monasteries and churches. There is a motorway linking Budapest with Vienna, and this makes the area very popular, and quite expensive. However there are good connections into Slovakia, Austria, and Germany. An example of the new industry in this area is the Audi construction plant in Gyor, which puts together all the Audi TT cars produced for global consumption. In the Southern part there is a main road to another border crossing to Austria, at Rabafuzes, this allows access to and from the South of Austria, and Italy etc. This area also borders the northern shores of Lake Balaton, which is a popular tourist spot. There are almost unlimited opportunities to fish, sail, bird-watch, swim, cycle, and wander through the forests, where hunting and collecting mushrooms are very popular. (Every market has a resident specialist who will identify the edible from the poisonous varieties of mushroom, it is advisable to collect different types separately !). Another very popular recreation is visiting the many thermal spas that can be found dotted throughout the area. There are numerous cultural events held year round, such as the spring festivals and dance and music events. Museums to satisfy every taste can be found in the cities and towns of the area, faithfully recording the history from pre-Roman times to the current industrial era and arts and crafts of the region. Not to be forgotton is the excellent food and wines of the area, including the famous Soproni Kekfrankos wine. The Northern border with Slovakia is formed by the Danube, and a popular cruise can be taken from Budapest to Vienna, by hydrofoil in the summer. This passes the tourist areas on the Danube Bend. © 1999 - 2015 Hunimex Kft.